During menopause, many women have to contend with extra fat appearing around the abdomen. This is due to a combination of factors, namely lifestyle and hormonal. 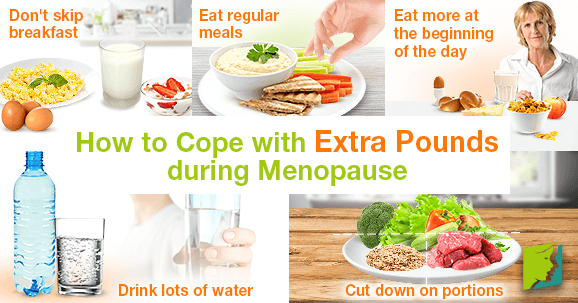 This excess weight can be difficult to shift, but does not have to be an inevitable part of menopause. Read on to learn which lifestyle changes you can implement in order to lose those stubborn pounds. Skipping breakfast encourages snacking and means missing out on essential nutrients. Breakfast is the ideal time to kick-start your digestive system and stock up on protein and fiber, which will result in the body feeling fuller for longer while building and maintaining muscle and skin. Protein-rich foods include eggs, milk, yogurt, and fish. Research demonstrates that eating small, regular meals throughout the day leads to calories being burned at a faster rate. This is because the body will enter periods of intense hunger if it does not receive food for too long, and eating after these periods will encourage the body to hold on to calories and also cause you to eat too fast, which will lead to bloating. Snacks between meals are not bad as long as they are healthy and nutritious. It's helpful to listen to the natural rhythm of the body and only eat when hungry. Eating the majority of calories earlier on in the day will mean you have energy for the most active part of your day, instead of consuming the heaviest meal before bedtime. As well as increasing the size of breakfast, it would also be a good idea to eat lighter and less starchy meals in evenings when you are less active. Many people often mistake hunger for thirst, so dehydration can lead to consumption of more calories. It is recommended to drink the equivalent of 1.5 liters per day, although more might be needed during exercise or when the weather is warm. Serving up food on smaller plates will trick the brain into feeling fuller more quickly. This is due to the fact that large plates make food look smaller. As a rule of thumb, half the plate should be a colorful variety of vegetables, a quarter should be protein, and a quarter carbohydrates. Planning healthy meals more consciously will also help prevent overeating of certain foods that can lead to weight gain. Managing weight can seem daunting, but it can be done. Healthy eating and exercise are the most sustainable and effective way to lose weight and keep it off. During menopause, hormones and weight gain are inextricably linked. Make sure to combine hormone regulating supplements with your lifestyle changes to get the best results in managing menopausal weight gain.